1) Moderating the extremes of moisture and temperature, and improving soil conditions to allow better root development. Less water is lost during periods of high temperature due to evaporation, and the evaporation that does occur helps to cool the soil. During periods of cold temperatures, a good layer of mulch helps to buffer the effects of freezing and wintertime moisture loss. 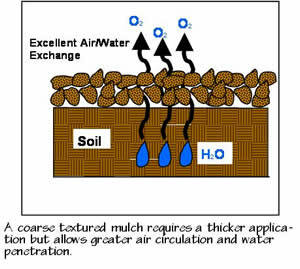 2) Mulch also minimizes erosion by absorbing and diffusing the force of rainfall and irrigation water. 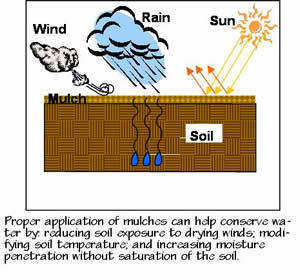 Mulches act as a sponge soaking up moisture and allowing it to penetrate the soil more slowly rather than running off. 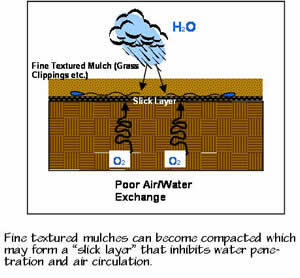 Mulch is especially useful on sloping sites to slow runoff and hold soil in place. 3) Mulches are the first line of defense against weeds. A good layer of mulch will bury weed seeds and discourage germination. Weeds that do germinate can more easily be removed due to the loose texture of the mulch and the higher moisture content of the soils below. 4) As mulch decomposes, it helps to improve the top few inches of soil, adding nutrients and organic material which allow water to penetrate more effectively. Wood chips, bark, pole peelings, straw, and grass clippings are all examples of commonly used organic mulches. These mulches are readily available, very effective and have the added benefit of improving the soil through decomposition. Organic mulches should typically be applied to a depth of 2—4” to be effective, stable, and promote weed control. Organic mulches should have a new layer applied every two years or so to account for decomposition and maintain the proper depth. Gravel and rock mulches are the most commonly used inorganic mulches. Both are stable in the landscape and help to retain moisture, but have a tendency to collect excess heat when exposed to sunlight. Gravel and rock are typically applied over a layer of synthetic filter fabric which allows water and air to circulate. Black plastic sheeting is not recommended for use in the landscape because it does not allow air and water to penetrate the soil and it creates excessive runoff, thereby counteracting the goal of water conservation.